with the Prairie Band Potawatomi Nation Police Department, per the Potawatomi Law & Order Code amendment. Mission: To serve the community in a respectful, fair and consistent manner with professionalism, honor and integrity. 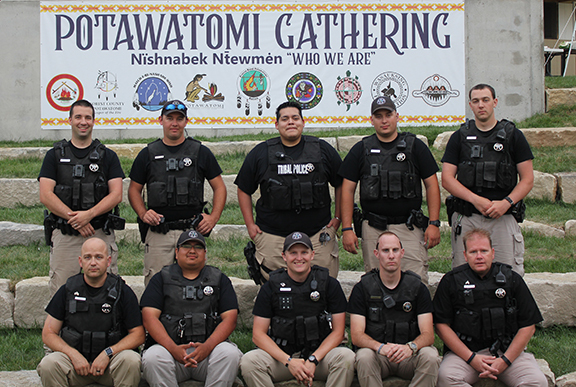 Tribal police officers respond to calls for service, complete investigations, conduct house or welfare checks as requested, perform normal patrol duties as well as enforce tribal criminal and traffic laws as established by the Prairie Band Potawatomi Nation Tribal Council. All officers are trained in and incorporate community policing principals in their everyday activities. Tribal Police Dispatch is a twenty-four/seven operation with the responsibility of supporting field officers and Tribal Fire/EMS Units. 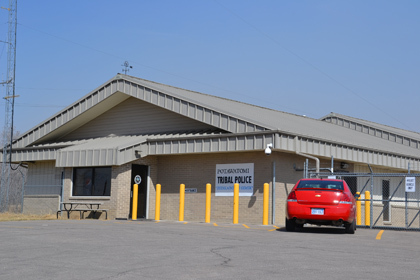 Tribal Police Dispatch is a fully operational dispatch center. During one audit conducted by the Kansas Highway Patrol, Tribal Dispatch were rated as one of the best (in security, procedures, training and operations) in the state. The Animal Control unit began in March 2000 with the office being responsible for enforcing Prairie Band Potawatomi Nation Law & Order Code Title 20. An animal control officer patrols the housing sites, government building areas and other areas as requested by reservation residents for nuisance animals and other animal concerns. There is also an animal pound. Owners of impounded animals are required to remit fines and boarding costs before their animal is released. Rabies Clinic: Each spring a Rabies Clinic is held for reservation residents to bring their animal for free rabies vaccination and a flea and tick dip. A veterinary clinic performs the vaccination and has other supplies available for purchase. Adoption: Some animals at the pound are available for adoption. Wildlife Conservation: The Tribal Police Department has a dedicated staff to oversee the areas of hunting and fishing on the reservation. Community Programs: The Tribal Police Department strives to maintain a positive presence in the community. Officers and staff are involved each year in the PBPN Christmas Gift Drive program, Earth Day celebration, powwows, and other community events. The department also provides community services such as car seat distribution and a youth summer camp. 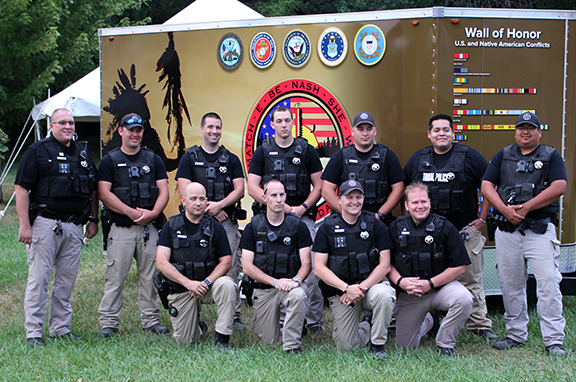 Department History: The Tribal Police Department was initiated in 1996, and has provided service to the Prairie Band Potawatomi Nation for over 20 years.